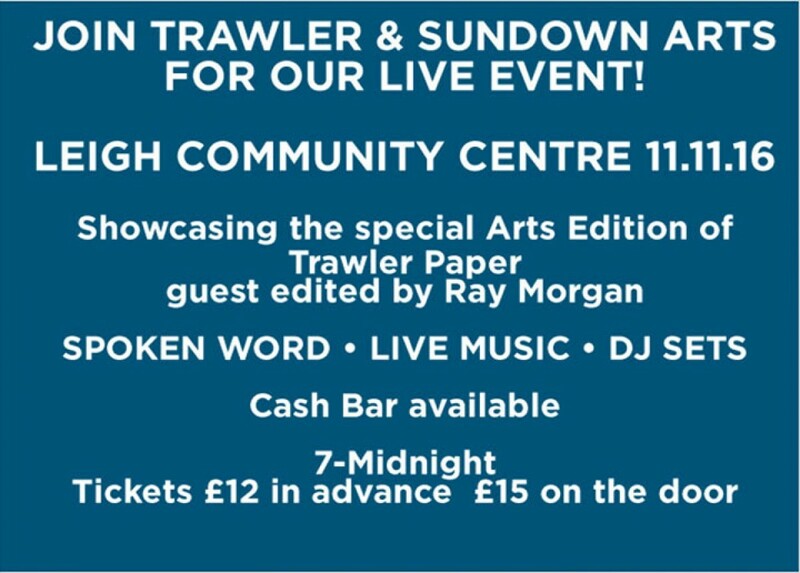 Join Sundown Arts and the Made in Leigh collective to launch the special arts edition of Trawler Paper, guest edited by Ray Morgan. 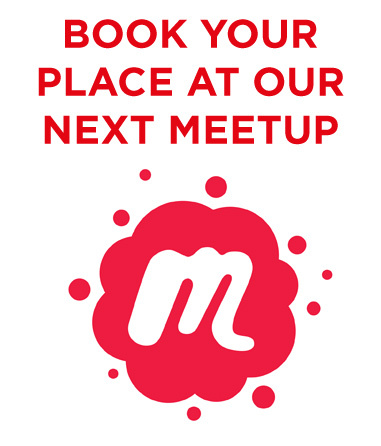 From 7pm at the Leigh Community Centre, Elm Road, Leigh-on-Sea. The evening will start with drinks in the bar, followed by performances in the Lower Hall: spoken word, pop-up theatre performance, live music, followed by an after-party in the bar until midnight - drinks and dancing! 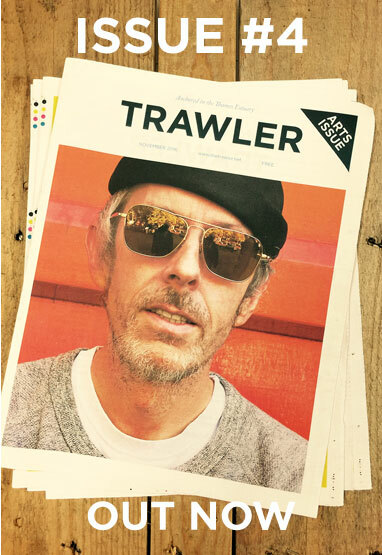 Trawler is all-inclusive - we like to think that everyone can somehow be involved in Trawler should they want to - which is why we were utterly delighted when local poetry goddess Ray Morgan agreed to not only guest edit our next issue of Trawler but also curate our next live event! Join us on Friday 11th November 2016 from 7pm-Midnight with a load of other nice, like-minded individuals for an amazing evening of spoken word, live music performances and a few surprises along the way too. After a succession bands – The ProTeens, Regentone, The Adjustment etc, Essex based singer songwriter Lance Baldock settled on the nom-de-rock of CUSACK. In 2010 he released the acclaimed debut ‘Mildsensations‘ after spending a number of years toiling around Essex and London with excellent backing band The Mildsensations. Lance is also one half of two-man power trio SON OF BUFF. SOB was born in the bowels of the Railway Hotel a coupla years back over beers with Ben Floyd of local legends Archimedes. Since then they’ve been recording their debut album with Ted Davis and raising rafters and a few eyebrows along the way. Think The Black Keys, Black Sabbath, At the Drive-in, Queens of the Stoneage, Nirvana, PJ Harvey…we are angsty, dirty, loud and proud. Cherry is one of the original founders of Sundown Arts, now focused on her own solo material as one of Southend’s busiest performance poets. She has collaborated with Dirty Fairies and Captain’s Daughter to form Dirty Captain Scott, and has supported John Cooper Clark at the Railway Hotel. She’s a bold, vibrant poet who lures you in with tales of late night trains, seafront life and dark family portraits. Simon is one of Sundown’s favourite performers. With the wit of Spike Milligan and the vim of John Shuttleworth, Simon performs poems on pigeons, snails, hitch-hiking and bootsales. If it’s mundane, he writes about it, and transforms the everyday into the silly and sublime. Rachel was first spotted at a spoken word open mic night and has become one of Sundown’s most cherished finds. She writes deftly on life, love, and brings her experiences and memories to life so well you’d think they were your own. Ann is a playwright and poet who for many years was a stalwart member of the Palace Writers’ Group, founded at the Palace Theatre. From amusing observances on life to more meaty topical subjects seen in the news, Ann’s quiet power comes from her economy with words. A gem. Another playwright and poet, Gill’s strengths are in her monologues where vibrant characters come to life with a succession of accents, hats, and facial expressions. We’ve witness monologues featuring several characters so well performed that you forget it’s just Gill standing there on her own. Having written many plays and poetic performances, Gill’s enthusiasm is as infectious as her character-led stories. Ryan spends much of his time writing and producing for both TV and theatre. He co-owns award-winning TV production company, Deadpan Films and is Co-Artistic Director of The Dickens Theatre Company, based in Rochester. TV acting credits include London’s Burning, Murder In Mind, Rosemary and Thyme, Coupling and Harry Hill’s TV Burp. Most recently he has been seen as Sgt. Kenny Morris in EastEnders. Southend-on-Sea based alternative radio station; named after the SS Montgomery - a notable landmark of the Thames Delta, SFOB’s impressive roster of DJs bring you the very best music across the board – they are not limited to genre, the only rule is that the music is good. NOT play-listed and never will be. Every Friday Paul Miggins, Paul Coop & Paul Laggers digitalise a chunk of their vinyl collections for your consumption via the interwebs. Downloadable bites of perfectly eclectic music – an education in music even for the biggest muso. Set to be the best Trawler event yet you'll want to be here! "Thanks for organising such a great evening"
"It was a super duper evening"
"Had a FAB night.. Thank you!"